Effectively present a thorough SWOT analysis of your company with slides designed to highlight your results. When evaluating the potential of a business venture, in-depth analysis is crucial to making educated decisions. The SWOT Analysis Keynote Template’s slides clearly explain your findings, so you can make sure everyone on your team is on the same page. With 29 fully editable slides available in four color schemes, the template features slides specifically designed to effectively communicate the strengths, weaknesses, opportunities, and threats of a venture. Professional infographics can easily be updated with your own text. High-quality business icons complement slides and can be adjusted for size and color. 29 unique presentation slides designed by professionals that you can easily edit and fill out with your personal content. 16 icons are used in this template which you can flawlessly move, resize or change colors throughout your presentation slides. In the downloads folder of your computer, you will now see a file labeled with your presentation template’s name. The file will end with the suffix .zip. In order to begin using your template, you need to unzip the folder. On a Mac, simply double-click on the folder to unpack the contents of the folder. To use the custom fonts included in your presentation, you need to add the included fonts to your computer’s font library. Double-click on the Fonts folder to see the individual fonts included in your presentation template. On a Mac, open Font Book (you can find this by searching for Font Book) and drag and drop the individual font files over to the list of fonts. The fonts will now be added to your library and you can use them in any program on your computer, just like you would use Times New Roman. Finally, in the Keynote folder, you will find your presentation template. Double-click on the presentation template to launch Keynote and begin using your template. 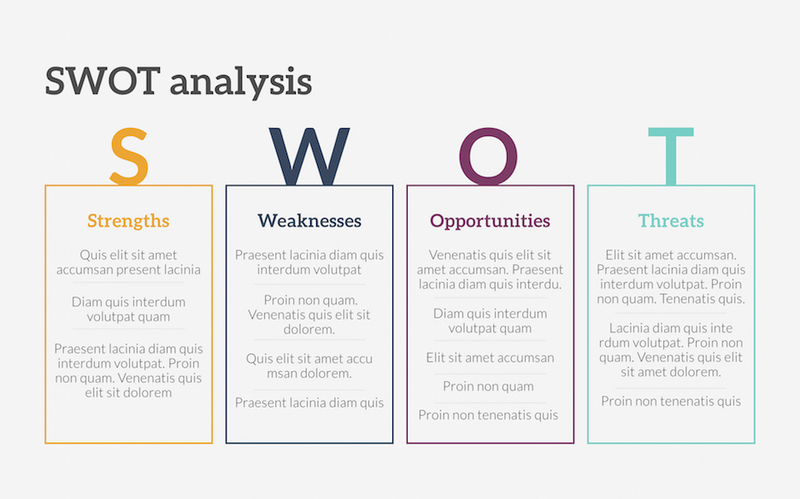 What's included in SWOT Analysis Keynote Template?